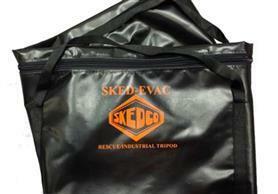 Vinyl transport bag for storing and carrying your Sked® Evac Tripod (SK700). Features heavy duty vinyl coated nylon material and an extra long zipper along its full length and across it’s ends to facilitate easy repackaging. It has a pocket inside in the center to store the bag of chain which comes with the tripod, preventing the chain from sliding to one end when the tripod is carried. There are handles in the center and on each end of the bag. This bag has a 9″ diameter and a 7’1″ length, and will make nearly any brand of tripod easier to carry. Made in USA.